“I’d summarise Thylacine’s work on our Voyage to the Deep exhibition as ‘imagination cached in practicality’. Thylacine did all our structural and graphic design for the project. Creating things to transport our visitors to new worlds, but in such a way that our fabricators could effectively construct them. “They are very inventive – able to devise things that have never been done before, such as a portable, safe, explore-able forest of giant kelp. All the staff at Thylacine are easy to deal with, even from a different city; very helpful and approachable. It felt like they cared about our project and achieving the best for us. The exhibition is an experiential family orientated travelling exhibition for the Australian National Maritime Museum opening in time for the summer holiday period. Voyage to the Deep is about undersea exploration and adventure drawing inspiration from Jules Verne’s novel 20,000 Leagues Under the Sea and the literary genre of steam punk. The exhibition presents both the fantasy of the novel and the facts of today, allowing visitors to explore both Verne’s imaginary world and the real-life wonders of the oceans. 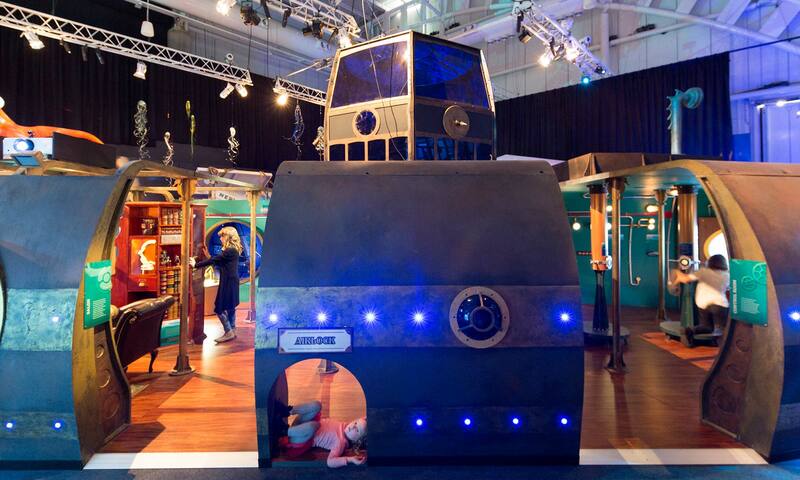 Our design approach on this exhibition was to create an undersea environment to explore and be immersed within. Elements of this environment included a steam punk interactive submarine the ‘nautilus’, a shipwreck, a forest of giant kelp and the Atlantis interactive. Our highly successful illustrative work on the exhibition was used for the exhibition branding and advertising. The exhibition will travel to many destinations over the next five years.